The aim of this pilot registry study was to evaluate the effectiveness of Lady Prelox® for improving/controlling sexual dysfunction (SD) in post-menopausal women with a healthy circulation. 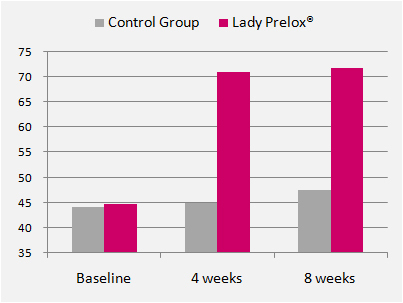 The Lady Prelox® and control groups were comparable at inclusion with regard to the Female Sexual Function Index (FSFI) score with 36 women (50.1 ± 3.1 years) and 39 women (51.2 ± 2.3 years), respectively. After four weeks treatment there was a significant improvement in the group, which sustained until completion of the eight-week trial period. Minor, non-significant changes were observed in controls. The median FSFI score at inclusion was 44.6 and significantly increased to 70.9 after four weeks and remained at this level after eight weeks. In the control group the total FSFI was 44.1 at inclusion, and reached 45.0 after four weeks and 47.4 after eight weeks, respectively. The treatment with Lady Prelox® was comparatively more effective than placebo. This study opens an interesting view for women suffering from sexual function problems and suggests a promising new treatment option.